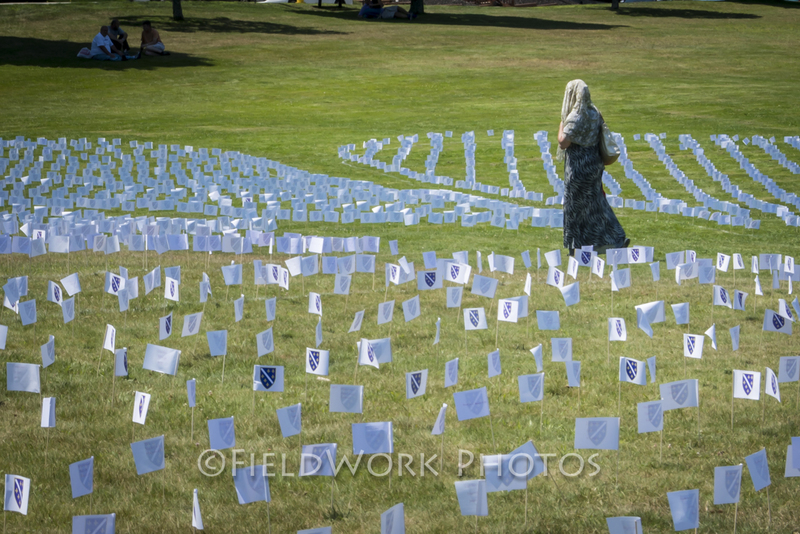 So far Becky Field has created 13 blog entries. I found this article important and moving. 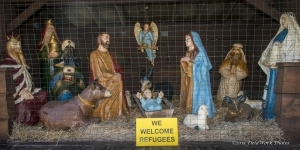 It is understandable that some … want to pretend that they are not refugees. It is more glamorous to be an exile, more comprehensible to be an immigrant, more desirable to be an expatriate. The need to belong can change refugees themselves both consciously and unconsciously, as has happened to me and others. “Different Roots, Common Dreams” has received two national book awards. First is a 2016 Benjamin Franklin book award from the Independent Book Publishers Association – a silver award in the Multicultural category. I flew to Salt Lake City, UT, in early April for the award ceremony which was a fascinating and fun time. ALSO, the book has won a 2016 “IPPY” book award from Independent Publishers (a separate organization), also a silver in the Multicultural-nonfiction adult category. There are the two major organizations for books released by independent publishers. I share these awards with my book publisher, Peter E. Randall Publisher, and especially with all my immigrant friends who so generously contributed to making my dreams of this book a reality! By Becky Field|2016-04-17T13:04:55+00:00March 15th, 2016|About the Book|Comments Off on Book wins national award! “Different Roots, Common Dreams” received a wonderful review from the Midwest Book Review! They stated that it “is a pleasure to browse through and … very highly recommended.” Here’s the review. Synopsis: New Hampshire is 92% “white,” so few people have experienced the emerging cultural diversity in the Granite State. 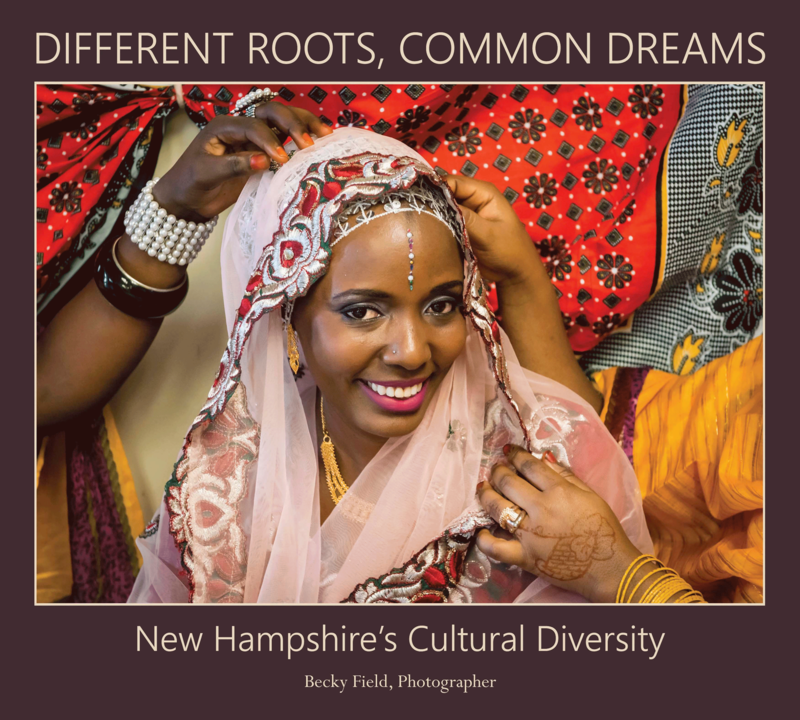 For more than three years, photographer Becky Field has documented the lives of NH’s immigrants and refugees through photographing their weddings, funerals, workplaces, children at play, sacred ceremonies, and joyful celebrations. 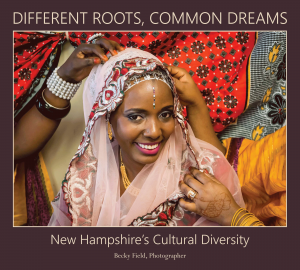 Through Becky’s photographs and stories by NH’s refugees, “Different Roots, Common Dreams” tells of the journeys and celebrates the beauty and resilience of NH’s new American families. Critique: Combing occasional commentary and beautiful photographic images, captioned and in full color, “Different Roots, Common Dreams” is a pleasure to browse through and ultimately quite informative. Simply stated, “Different Roots, Common Dreams” is very highly recommended for personal, community, and academic library Contemporary American Photography and Ethnic Photographic Studies collections. 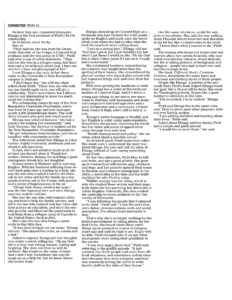 By Becky Field|2016-03-22T17:29:34+00:00January 27th, 2016|Uncategorized|Comments Off on Great Book Review! 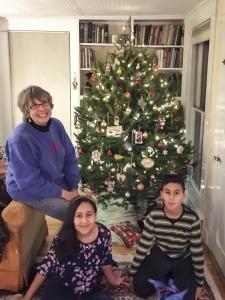 I am gazing on the “most perfect Christmas tree ever,” created with the help of two young friends whose family came to New Hampshire originally from Iraq. They share their Muslim faith traditions with me and visa versa, an exchange that has enriched us all! 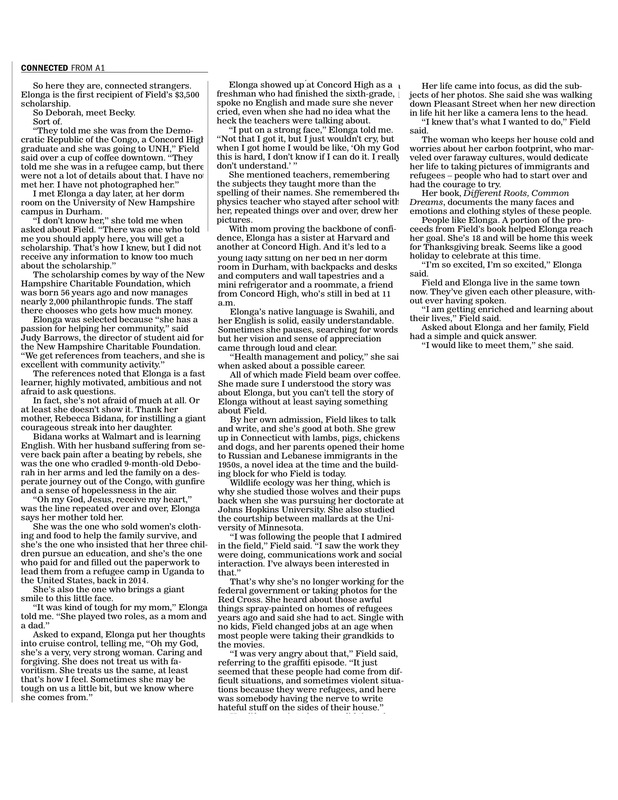 There was an opinion article by Elizabeth Stevens of Walpole in the Concord Monitor on this Christmas Eve day. I have linked it below. These important words parallel my own feelings as we start 2016. In this new year, it will be more important than ever to say an emphatic “no” to the hateful, violence-mongering and mis-informed words of those out there who want to close our borders and communities to families fleeing for their lives. Have we forgotten that Joseph and Mary were refugees also fleeing persecution? Would we have said “no” to them? Wishing you and yours abundant peace and goodwill in the New Year. Hard to Keep Up with This Immigrant! Remember the 2012 Olympics? It was big news in New Hampshire because former Concord High School student and distance runner, Guor Miading Miaker, was competing in the marathon. His story had an unusual twist back then, and continues today with more twists and turns. Gour (who also uses the last name Marial) escaped to New Hampshire as a teenager in 2001 from war-torn Sudan. More than two dozen of his family members had died during the grueling Sudanese civil war; he himself was kidnapped, assaulted and forced into slavery. Finally he was able to get to the United States. In 2011 South Sudan declared independence from Sudan becoming the world’s newest country. 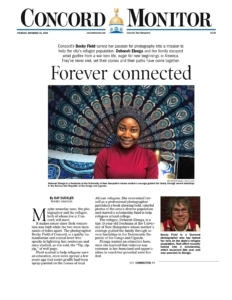 After resettling in New Hampshire, Guor excelled in distance running at Concord High, winning national championships and a college scholarship. In his first-ever marathon, he qualified for the 2012 Olympics in London – but there was a problem. Gour had no country affiliation for the Olympics. South Sudan was too new a country with no Olympic team; he wouldn’t run for Sudan after such war atrocities; and he couldn’t run with the U.S. team because he was not yet a citizen. Nevertheless, with help from many, including Senator Jeanne Shaheen, the IOC gave Gour the rare status to compete as an Independent Olympic Athlete. On a predawn Sunday morning in August 2012, I joined Gour’s South Sudanese friends and relatives in a crowded Manchester apartment to watch the marathon live from London. They cheered and ululated exuberantly each time his neon-green running shoes appeared on the TV. That he finished 47th was irrelevant. What mattered was that he ran in honor of their new homeland. Read more. Fast forward to this year – more obstacles appeared in the path of Guor competing for his country. South Sudan had to apply for Olympic recognition in the 2016 summer Olympics in Brazil. 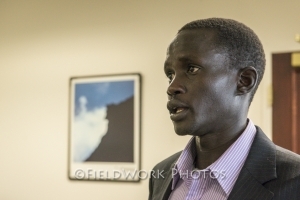 Then last January Guor received a scholarship from the IOC to train for the 2016 games, but the South Sudan Athletic Federation demanded that the money come to them, otherwise they would not let him be part of their team. Fortunately the IOC and others stepped in, persuading South Sudan to reverse their ultimatum. Read more. And here’s the latest: just last week, South Sudan’s application was finally accepted by the IOC. It was an emotional acceptance ceremony. 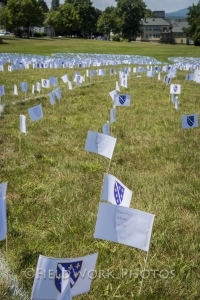 This new status bolsters a war-weary county, perhaps even bringing a sense of unity and peace. Read more. So, be sure to watch the 2016 Olympics and cheer for this speedy, former New Hampshire immigrant. 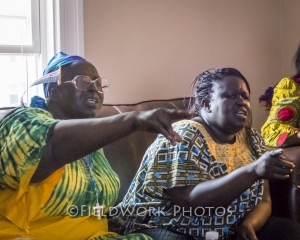 By Becky Field|2016-03-22T17:28:19+00:00August 15th, 2015|Immigration in NH, Meeting Our Neighbors|Comments Off on Hard to Keep Up with This Immigrant! The Muslim holy month of Ramadan has just come to an end. 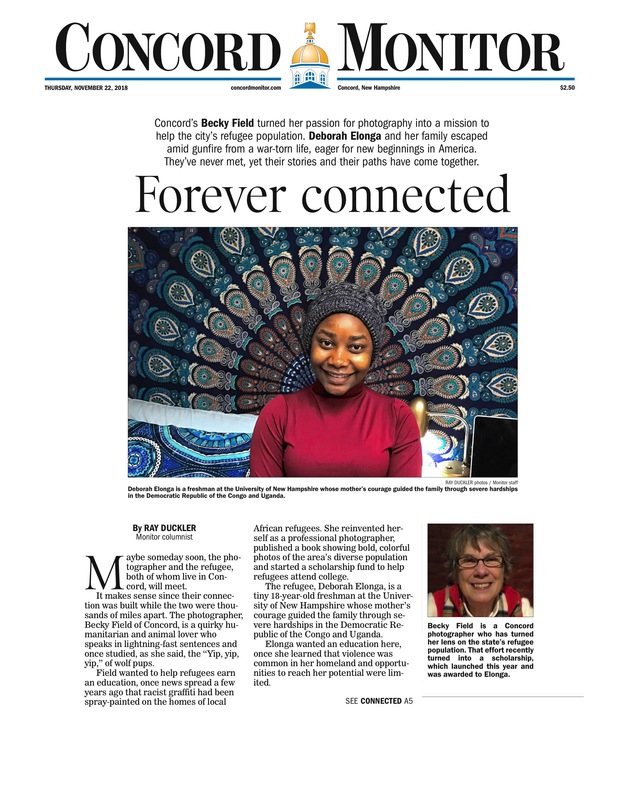 In the last few years, I have been fortunate to learn a thing or two about this holy season through my photography within the Muslim community in New Hampshire. The start of Ramadan varies every year, timed on the sighting of a new, crescent moon. This holy month is for introspection, increased devotion, and fasting from dawn to sunset. Eid marks the end of Ramadan. On the day of Eid, Muslims stop fasting and are encouraged to forgive others and let go of animosities. Families and friends get together for joyful celebrations with new clothes, gifts and food, especially sweets. The date of Eid is determined by the appearance of the next crescent moon. Two years ago at the time of Eid, joy was dampened in Manchester’s Muslim community because their new, partially built mosque had been vandalized. The six-sided brick building, located on a wooded hillside, was designed with high arching windows. Because of their size and contours, the windows were fitted with special and expensive glass. The vandals had smashed the glass in every one of those windows. Despite this sad event, leaders of the Islamic community were eager to observe the rising of the crescent moon that year from their new mosque site. They invited me and my camera to join them. The mosque seemed more a construction site than a holy building. We passed a locked chain-linked fence and climbed up a crude wooden plank into the vast sanctuary with angled brick walls. Tools, boards, buckets and other signs of the builders were all about. I carefully climbed a construction ladder to get onto the second level of the building. On the floor in the fading daylight I saw the glimmer of shattered glass all around. Pointed glass shards still stuck out of the rims of the arched windows. 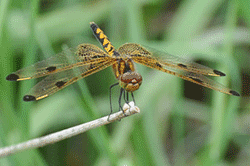 Soon we saw it, rising over the treetops – the white sliver of a crescent moon. 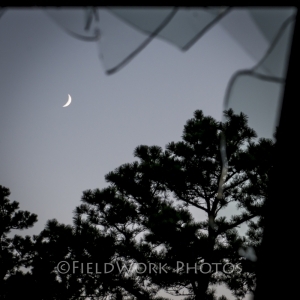 As I quickly clicked the shutter in the dimming light, I sensed the irony of photographing a moon that marked a time of forgiveness and peace through a window rimmed with glass shards from an act of malice. 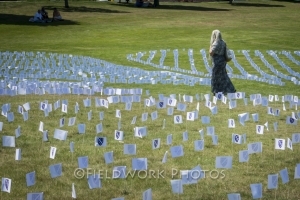 foreground are softened from being slightly out of focus. Maybe that in fact is the message of Eid – focusing on forgiveness, symbolized in that rising crescent moon, can soften the sharp edges of hate and destruction.